Anyone familiar with Japanese politics would know that MP Taro Kono never shies away from swimming against the tide, whenever needed. This Japanese Liberal Democratic Party (LDP) member has famously opposed the government nuclear policy, plans for nuclear fuel and building new stations. He also supports an amendment of the Japanese Constitution, which allows the self-defense forces to engage in warfare and "conflicts with the official position" on the issue of US Marine Corps Air Station in the Okinawan City of Futenma. In fact, so different are his views that the Wall Street Journal labelled him a "LDP Rebel with a Cause" in a profile piece about him published in 2011. There is also another aspect to this politician. By Japanese standards, he is uniquely internationally-minded. Despite a long history of tensions with South Korea, he was the only lawmaker in his country to have had a Korean version on his official website. Korean interns regularly work with him and he maintains interesting views on the future of relations with both Korea and China. More interestingly, Kono has a deep-rooted and genuine interest in Middle Eastern affairs. When I visited his office at the Japanese Parliament last year, I was fascinated to see that he possesses more books about the Arab world than I do. 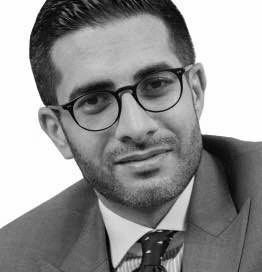 He almost always has an intern working at his office who hails from the Middle East, and speaks Arabic. He has visited a number of Arab countries including Syria, Lebanon, Jordan, UAE and Saudi Arabia. Currently, a senior Saudi delegation, led by Deputy Crown Prince Mohammad bin Salman, is in Tokyo as part of a high-profile Asian tour, which will conclude next week at the G20 Conference in China. The delegation has signed MoUs, business deals and has been engaging in cultural diplomacy activities in a bid to strengthen the Kingdom's alliances in the East. 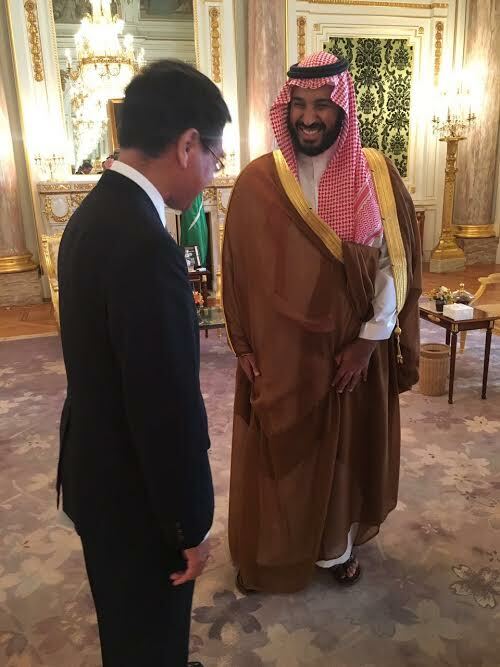 MP Taro Kono is scheduled to meet with Saudi Arabia's Deputy Crown Prince Mohammad bin Salman, who is also the country's defense minister and the architect of Vision 2030; an ambitious reform plan which aims to balance the kingdom's financial sheets, end the reliance on oil by diversifying the economy, open-up the country and improve the standards of living of Saudi citizens. Mr. Kono has agreed to answer a few questions via email prior to his meeting with Prince Mohammad. Having been the chief cost-cutter for Japan's national budget for over a decade, and a Minister for Administrative Reform, the meeting with Prince Mohammad is expected to be fruitful, considering that Mr. Kono says that he understands how hard Riyadh is trying to transform its role and streamline the budget. "We hope to share our experience and work together," he says. Contrary to the mainstream political views in Japan, Mr. Kono believes that his country should take in Syrian refugees and be "more politically involved in the Middle Eastern affairs." 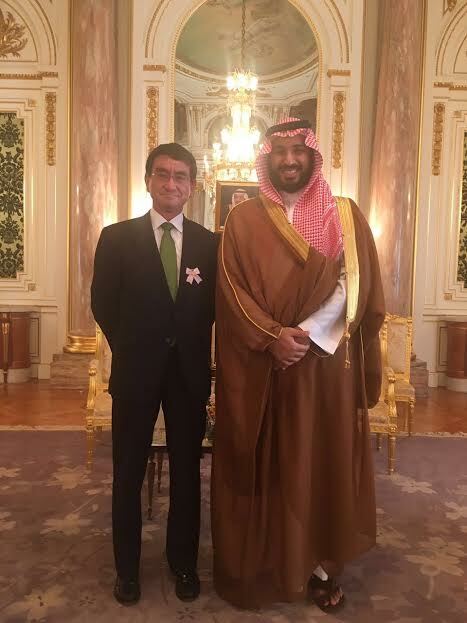 Furthermore, Mr. Kono (who has served as Chairperson of the National Public Safety Commission under current PM Abe) believes Japan and Saudi Arabia can cooperate in areas such as combatting terrorism, particularly given the Japanese security emphasis in the build up to the 2020 Olympics, which his country will host. This, of course, goes hand-in-hand with Saudi Arabia leadership of the Riyadh-based coalition of more than 30 countries called the Islamic Alliance to Fight Terrorism (IAFT), which Prince Mohammad oversaw the formation of, with the objective to defeat international violent extremism militarily, ideologically, financially and electronically. - Al Arabiya English: In December last year, you went on record saying that Japan needs an integrated immigration policy to cope up with its shrinking policy, or risk losing to China in competition for vital foreign workers. To what extent is the Japanese society willing to accept an influx of foreign workers? And do you think the society would have a preference for or against Arab immigrants? TK: Japan is fast losing its population, and its birth rate is still around 1.4, which means unless Japan allows immigration, it cannot sustain its economy. Immigration, however, is still a very touchy issue in Japan. Although many Japanese people might be skeptical about accepting immigrants, and the official government policy still denies foreign workers, in reality, there are many foreign workers, or cheap foreign workers to be exact, already in Japan. Many Chinese and South East Asians have come as "trainees" and many Japanese-Peruvians and Japanese-Brazilians have been admitted under the pretext of having the Japanese blood. They are, nonetheless, nothing but cheap workers. Without them we will not be able to build facilities necessary for the Tokyo Olympic Games in 2020 and the lettuce and cabbage will go rotten in the field. If, or when, Japan is to open up for immigrants, what matters most is the language capability. We have learned that hard way. In the 1980s many Japanese descendants came from South America to work in factories in Japan. They all had the Japanese blood but most of them were not able to speak the language. They were not able to assimilate into the society. It is not the blood that matters, but the language. Japan today is non-religious country, or the Japanese people are not religiously dedicated. Many Japanese have their wedding in the Christian church, most funerals in Japan are held with the Buddhist monks. The Japanese kids believe in Santa Claus and every town has a Shinto shrine where people enjoy the Shinto festivals. Even Halloween and St. Valentine's Day are celebrated by young Japanese. When you talk about the word "religion" in Japan, you need to understand the same word probably means very different culturally from your country. That is something both the Japanese society and a foreign immigrant need to understand and work together to overcome. So anyone who can speak or is willing to speak the Japanese language and understands the Japanese idea about religions should be welcome. - Al Arabiya English: Workforce aside, Japan has made negative headlines with regard to its position which doesn't favor bringing in Syrian refugees. This position is strange coming from a major country which is both well-off and in need of immigrants. What are your thoughts on this and what can be done to convince the Japanese to do more for Syrian refugees? TK: It is true that Japan has not accepted many refugees. I believe this needs to be changed. The Japanese society needs to change so that we can accept immigrants or refugees as new members of the community. - Al Arabiya English: There is a major Saudi delegation visiting Japan at the moment, and you have been to the kingdom on several occasions and you have said that Japan is seeking multilayered relations. What are the points on your agenda for the upcoming meeting in Tokyo and how do you see Japanese-Saudi relations developing and working together to resolve regional issues? TK: As said earlier, Japan is religiously very neutral; there are almost no Muslims and Jews, and the Christian population is about 1%. Japan sells no weapon systems to anybody on this planet. Japan has had a very good relationship with the United States. The Japanese economy depends on the oil and gas from the Middle East. So Japan can be an honest broker in the Palestine peace process and can agree to disagree with the United States. It is time for Japan to be politically more involved in the Middle Eastern affairs and play an independent role in solving the regional conflicts. In order to take such steps, I believe we need to create much stronger personal relationship with Arab nations at many levels. Politicians should be able to pick up a phone and call their counterparts when necessary. We have established an organization called the Japan-Arab Leadership network, and its members have visited Arab countries every year for last fifteen years. We would like to extend this network to the Kingdom of Saudi Arabia as well. Japan is transforming its economy. Much of manufacturing has moved out of the country to near the market. Japan is more heavily relying on automation as the supply of the labor contracting. On the other hand, Saudi Arabia has an exploding population especially at the young generation. There are a lot to complement each other's economy. I have been the cost-cutter for the national budget for last 10 years and had been Minister for Administrative Reform. The Saudi government is now trying hard to transform its role and to streamline the budget. I hope to share our experience and work together. - Al Arabiya English: Late last year, you mentioned that ISIS could mount a cyberattack in Japan. Also Japan - like Saudi Arabia and other Arab countries - was a victim of terrorism when Japanese hostages were murdered by ISIS. As you know KSA has established and is leading a new Islamic Anti-Terror coalition. Do you see room for more and active cooperation with Japan on this front? And what can be hoped to be achieved? TK: We all need to fight against terrorism. As the host of the 2020 Olympic Games, Japan is stepping up anti-terrorist measures. We shall exchange information and work together to prevent terrorism in the real world and in the cyber world. The possible damages caused by the cyber terrorism is limitless. We need to closely cooperate with each other to protect our people and economy from cyber-attacks.